I called myself cutting away some fly always. Higher up the shaft then where I trimmed from is where I was clipping.Girl! I wasn’t paying attention for a split second and I cut the strand of hair nearly to the root. It was a small section and nobody would know unless I told them it was there(let’s hope you guys can keep a secret lol). In fact when I went to find the strand I couldn’t. But baby you couldn’t tell me that in that moment. I was nearly hysterical. Ya girl was in the bathroom screaming bloody marry. My boyfriend comes running in to the bathroom. He finds me staring at the lock of hair in my hand.My mouth was wide open and I’m on the brink of tears. I was shaking and all. Yes, I know way over the top. I couldn’t believe that I had done this to myself. As easy of a mistake as it was to make I just couldn’t believe I did it. I was a mess needless to say in less than five minutes I got a grip on reality.I apologized to my guy. I told him I just needed a second to calm down. I was even able to laugh at myself, because gosh darn it, it was funny. In life we can take our selves so seriously. You have to be able to laugh at yourself from time to time. I felt like the kid off of the barbershop movie. you all probably know the scene.His mom says sooner or later everybody was going to be walking around with a patch in their head after the barber nicked him. The only problem was I was the one holding the clippers in this scenario. There was no one to blame but me. All in all I realized that it was only hair and like he said it will grow back. We put so much pressure on our selves about our hair and if were honest many other things. At times completely unnecessarily. Yes by all means take care of your hair but don’t forget it is just hair. Don’t get me wrong. 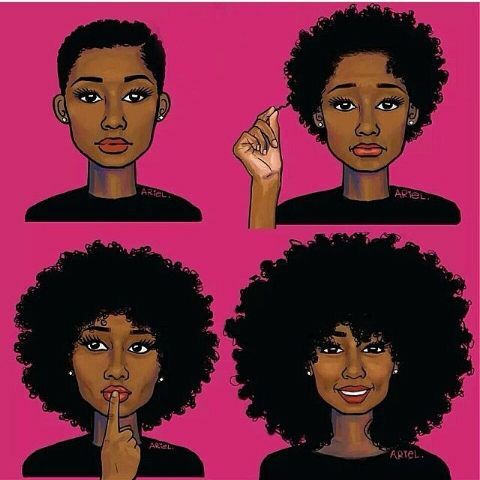 I love my natural hair and always will. I love that black women are embracing their natural hair, and it’s caused a movement that has started self-confidence and self acceptance.But, if anything was to happened to my hair or yours (God forbid) I would still be me and you would still be you. I truly believe that everything happens for a reason.This experience was to remind me it’s just hair. So when you find yourself going over the edge over your hair remember, it’s just hair.Remember, be happy, be curly, be you, and you will never fail. P.S no loving boyfirends were hurt in the making of this blog post. This Post was posted in hairstory and tagged #bantuknots, #blowouts, #curlyhaircommunity, #haircare, #naturalhaircommunity, #twistouts, #twists, afros, big hair, coils, curly hair, healthy hair, natural hair. Bookmark the permalink.